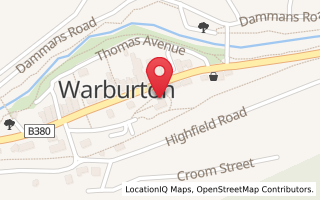 >HOME >Tourist Info >Warburton Newsletters >July 2013 - Snow in Warburton? Updated Friday July 19: Looks like snow will come tomorrow! - snow falls are predicted Saturday - Monday. It's going to be cold and wet this weekend - and that means SNOW is coming. 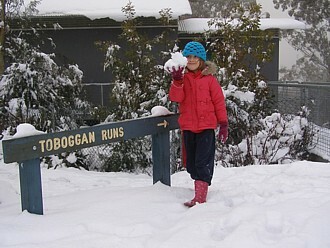 Forecasts are tipping snow will start falling on Mt Donna Buang this weekend! So brush the cobwebs off the toboggan, get out the winter woollies and get ready for some snow action. Generally speaking you don't need chains on your car to see the snow on Mt Donna Buang. There are several car parks just below the summit where you can park the car and walk the last 200m to the summit and the toboggan runs. After you have been up, let the info centre know if you have any feedback. Your info can help others during the weekend. Regardless of the weather, there are lots of cosy cafes and restaurants with fires to keep you warm. Enjoy great pizza, fresh coffee, fine dining, all day breakfasts and midday lunches. Of course the Warburton Bakery remains a favourite meeting place. The Upper Yarra Arts centre is open from 11am (exhibition and movies) and on Sundays, the Upper Yarra Museum is open in Yarra Junction between 11am - 4pm. The Water Wheel Visitor Information Centre (Ph 03 5966 9600) is open daily between 10am - 4pm - thanks to our great team of over 20 volunteers.